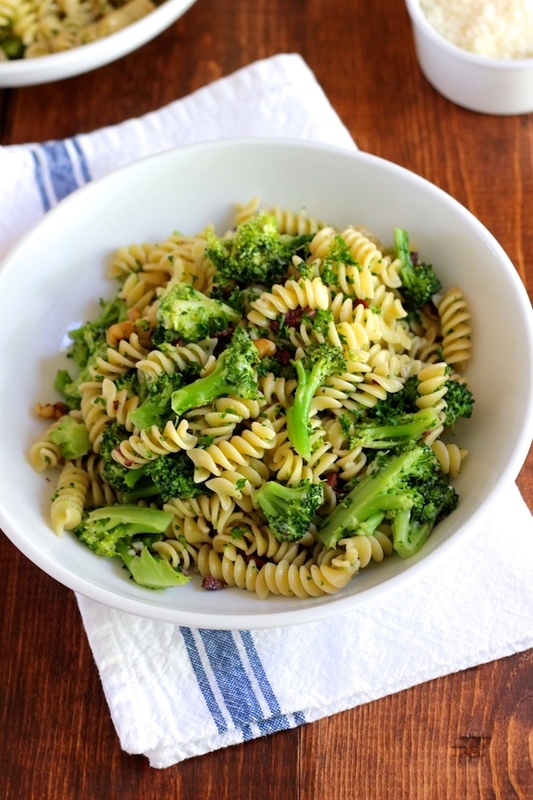 Since summer is officially here, I’ve decided to made a light, summery recipe – pasta with broccoli in a lemon garlic sauce. This is a light dish – no heavy dressing – just a little olive oil, lemon and garlic. I’ve also added some olives for their salty bite and a few walnuts for crunch. This recipe is pretty easy to put together since you cook the pasta and broccoli in the same pot of boiling water. I was worried that the broccoli would become mushy but by adding the broccoli in after the pasta has cooked for a few minutes, the broccoli comes out crisp, tender and a lovely bright green. You can use any type of pasta you want but I think a curly pasta works best – I used fusilli. You’ll be cooking the pasta and broccoli together in the same pot. You just need to add the broccoli in when there are only 5 minutes left until the pasta is done. So if your pasta needs to cook for 7 minutes – you would add the broccoli in after 2 minutes or if your pasta needs 9 minutes you would add the broccoli in after 4 minutes. 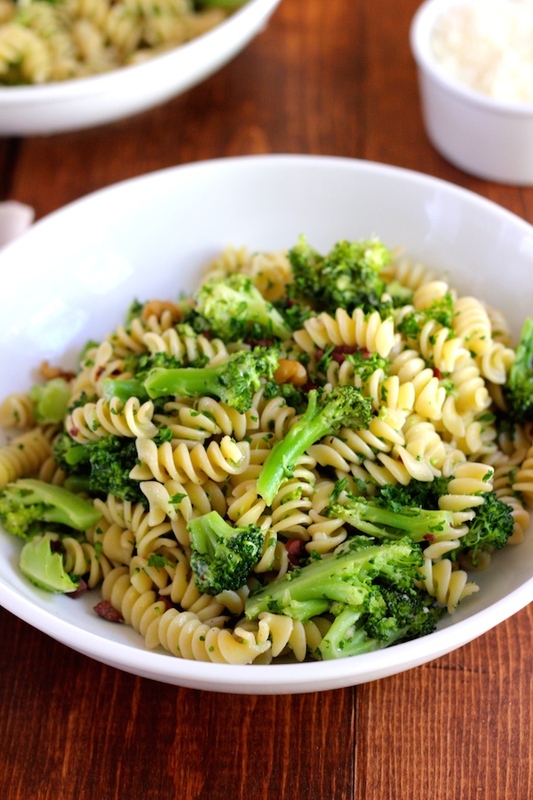 You’ll want to cut up the broccoli to be about the same size as the pasta you use. You don’t want any thick or large pieces of broccoli. If you have a large broccoli floret – just slice it in half (or even into quarters) lengthwise. I didn’t use the broccoli stem – just the florets. I think the secret to turning out a fast pasta dish in under 30 minutes is to do all the prep work first. That way you are not scrambling to find or chop or grate something at the last minute. So while you’re waiting for the water to come to a boil, do all your prep work and have everything prepped and ready to add in as you go along. Your pasta with broccoli will come together in a flash. Adapted from this recipe by Martha Stewart. Pasta with broccoli in a lemon garlic sauce. A light, summery pasta dish. 2 cloves of garlic – peeled and put through a press. Place a large pot on the stove and bring to a boil. While water is coming to a boil, prep all your ingredients so they are ready to use. Once water is boiling, add pasta and veggie bouillon cube. My pasta took a total of 7 minutes to cook. So I let the pasta cook for 2 minutes and then added the broccoli to the same pot. The broccoli only needs a total of 5 minutes to cook. While pasta and broccoli are cooking, add 2 tbs olive oil to a small saucepan and turn the heat on to medium high. After 30 seconds, add minced garlic, red pepper to taste and 8 twists of black pepper. Cook for 30 seconds, stirring or swirling constantly so garlic doesn’t burn. Add 1 small ladle of pasta water to olive oil and garlic mixture in the saucepan and cook over medium high heat until reduced by half – about 1 minute. Remove from heat and stir in lemon juice. Set aside. Drain pasta and broccoli. Add back in to the pot you were using or to a separate bowl. Add half the parmesan cheese and stir. Add minced olives, walnuts, lemon garlic sauce and remaining parmesan cheese and stir to combine. Stir in minced parsley and serve. This came just in time for me to utilize the broccoli from my CSA share! What a lovely combination of flavors. What kind of olives do you recommend for this recipe? Thank you for the lovely photos and inspiration! Hi Traci – I used kalamata olives – thanks for catching that, I’ve updated the recipe. And thanks for the compliment on the photos! Have a great day!